With a new and essential Periodica dropping once every couple of weeks, a perennial purple patch for the Mystic Jungle Tribe and relentless heat eminating from the whole Early Sounds fam, it's fair to say that Napoli has become ground zero for slack funk fire and the most spaced out, spangled disco around. The latest product of that prolific region comes from Early Sounds associated Nu Guinea, who look to the groovy heavy and giddy 80s club sounds of their home town for inspiration, serving us a brand new album of analogue synth licks, blaxplo guitars and stone cold funk, topped perfectly by some flawless female vocals. As ever, there's a touch of the library about it all but the strength of songwriting, arrangement and production ensures this is gonna be a sell out smash. Patrick says: It came, it went, it's back to conquer again. 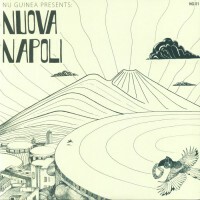 Nu Guinea's meticulous recreation of the 80s Neapolitan club sound far surpasses pure pastiche thanks to expert production, endless grooves and the necessary songwriting talents. Currently heading into the bags of all my most discerning customers, this is must have tackle!